This past weekend was another amazing day in the HIS-tory of this church plant miracle we call City on a Hill Church. It was our second annual picnic. The past seventeen months have flown by as we remain captivated and awestruck by God’s grace to us. The service was jam packed with a 9-11 remembrance, the commissioning of our first foreign missions team leaving for Belize on Saturday 9-17-11. I know, I know I thought the same thing! It is totally a God thing who could have scripted that a church plant would be sending missionaries less that 18 months into the journey? Okay back to the packed out service. We had an amazing time of prayer where we saw numerous breakthroughs and a powerful move of the Holy Spirit. There was special music and dynamic praise and worship and we had numerous scheduled baptisms. The centerpiece of the morning was the preaching of the Gospel of Jesus Christ as it is every week and COAH. It is all about Jesus it has always been about Jesus and it will always be about Jesus. Our sanctuary floor was being re-surfaced so we had to have our service outside on the patio. In Florida that means we are subject to the weather. Not so with us last year God held back the rain and gave us a beautiful blue sky and this year was no different. We are not subject to the weather we are subject to the one who tells the clouds when to rain at His command. All week I had talked with the Lord and I said, “Lord you made the sun stand still for Joshua and you held the rains back for us last year. I’m asking for your grace yet again.” We had the most beautiful weather and even a cool gentle breeze to the glory of God. Please never take God for granted and never forget to give praise where it is do and He is worthy. I felt strongly in my spirit all week that we were going to have an Acts 2 type experience and that people would repent, believe, and be baptized even fully clothed who had no intention of being baptized. We had 375 in attendance that day that God had gathered from the four corners of our city. Following the preaching of the Word of God we had many respond as I felt and we baptized 25 people that very day, many were fully clothed and felt compelled to follow the Lord in baptism. It was incredible!! The reason I titled this blog Noteworthy and quoteworthy was because of a story that was shared with me later in the day as we celebrated God’s amazing love and blessing. 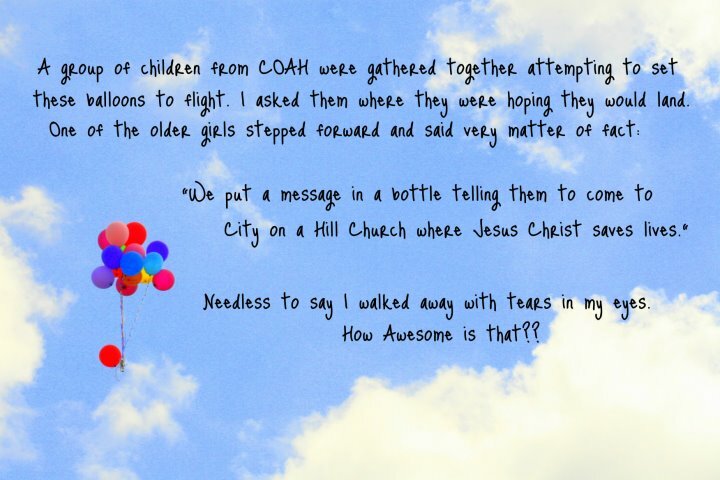 A lady named Leisa, who uses her God given gifts and takes all of the photos for the COAH as her ministry, shared a noteworthy and quoteworthy story. She saw a number of children with a group of balloons they were about to set to flight. Of course she wanted to get a picture. She asked one of the children where they wanted them to land. One of the older girls stepped forward and said very matter of fact, “We put a message in a bottle telling them to come to City on a Hill Church where Jesus Christ saves lives.” Leisa asked, “What did you say?” The little girl replied, “City on a Hill Church is where Jesus Christ saves lives didn’t you know that?” Needless to say Leisa walked away with a full heart and tears in her eyes praising and thanking God. My friends that is noteworthy and quoteworthy. When Leisa shared that story with me my heart jumped for joy. Even the children at COAH know it is all about Jesus it has always been about and it will always be about Jesus. It made that day even more real to me. As I was preaching the Gospel that morning I felt strongly compelled that I may never get to see those precious people God had gathered there together again and I preached like I wouldn’t. I preached like our very souls depended on it because they did and do. I preached salvation through Jesus Christ with passion, seasoned with grace and full of God’s love. We saw salvation come to many as they responded to the preaching of God’s Word. Every week since we opened City on a Hill Church has been a place where Jesus Christ saves lives. I pray that never changes. That is a noteworthy and quoteworthy truth. When I got home I was exhausted as I know 80 to 100 others were as well. However, my heart was full because I know and so do the army of volunteers at COAH who love God, Love People, and Preach Jesus every week that City on a Hill Church is where Jesus Christ saves lives. Be encouraged! Hostage: a person, in this case a ministry or service rendered unto God, given or held as security for the fulfillment of certain conditions or terms, promises, etc., by another. Job 6:14 “He who withholds kindness from a friend forsakes the fear of the Almighty. Job 6:14 scares me! It is straight forward and really calls us to understand who our service is to. It reminds us our ministry is unto God. It is all about Jesus. To withhold our ministry shows we have issues with who this thing is all about. It is the Lo’d’s kindness that brings men to repentance. It should be our kindness that reaches out to the lost. Church isn’t just about us and getting our way. Something far greater hangs in the balance, the souls of men, women, and children. The ministry that God has called us to must be manned daily and not just in the church building. We are the church in our city, homes, neighborhoods, schools, workplaces, and the marketplace. We are the church! To withhold our ministry is to hold back from God Almighty. Taking our ministry hostage until will get what we want only leaves us wanting. Look at Proverbs 11:24 it is pretty clear. Here is my worst fear as a pastor. When people disconnect because they are holding their ministries hostage they open the gates and begin to wander many times aimlessly until bitterness renders them ineffective and leaves them without a fellowship. I have seen it time and time again. My heart breaks. I see people in this city on a daily basis who have given up on the Bride of Christ because they didn’t get it their way. So if they couldn’t get it their way they get it no way and the kingdom of God suffers great loss. Not just the kingdom but the individual suffers greater loss and is left to live a life filled with what ifs, what could have beens, and the ones that got away. Proverbs 3:27 is simple do not withhold the good from whom it is due when it is within your power to do so. James says if we know the good we ought to do and choose not to do it we sin. Taking our ministry hostage ends in tragedy and untold and unknown collateral damage. Who knows who we could have reached? Who knows how your personal story could have impacted the lost and wanderer? Who knows how many lives could have been changed by a church operating in unity with Jesus Christ at the center? Only God knows, the rest are left to lament and wonder as they wander. This is a hard teaching I know but we must get this right. Before we start looking at others we must first look at ourselves. Did you see it? Did you see the key? Did you see the way to keep from holding ministry hostage? Did you see the attitude that could unify a church and change a city? Isaiah got his eyes off others and got His eyes on God. Isaiah saw God for who he is. Isaiah got things in perspective. But here is the biggest and most significant piece of the puzzle, Isaiah did a self-examination. Isaiah saw himself. Before he accused, pointed fingers, or played the blame game Isaiah took responsibility. It was in that moment that God cleansed Isaiah and prepared him for a life of ministry. Isaiah would never want to hold his ministry hostage because he lived for an audience of One. He saw who he was and he saw who God is and it put things in proper perspective. When you and I get a true glimpse of who we are and who God is we will never, ever attempt to hold our service to God hostage again to try to get our way. Instead we will seek to do things God’s way. We will understand it is by grace and grace alone that you and I get to do ministry and make our lives count for something greater than ourselves. Romans 12:1-2 1I appeal to you therefore, brothers, by the mercies of God, to present your bodies as a living sacrifice, holy and acceptable to God, which is your spiritual worship. 2 Do not be conformed to this world, but be transformed by the renewal of your mind, that by testing you may discern what is the will of God, what is good and acceptable and perfect. Therefore my brothers and sisters in view of God’s mercy offer yourselves as living sacrifices to God. A living sacrifice is too busy loving God, loving People, and preaching Jesus to take hostages. A living sacrifice is too busy giving God glory for His grace, love, and mercy that is changing a city by changing the lives of their friends, family, co-workers, school mates, and whosoever. Taking ministry hostage means we need to have a “come to Jesus meeting” in our hearts. We need to have an Isaiah experience. We need to take a long hard look at why we do what we do and for whom we do it. I know in my heart that City on a Hill Church is going to move forward. My preference, my strong desire is that it moves forward with everyone. I know we can do it without people who take ministry hostage, however I don’t want to. I also know that we don’t negotiate with irrational hostage takers. It is God’s way, the highway, or no way. It is all about Jesus it has always been about Jesus and it will always be about Jesus at COAH. I can not and will not allow anyone to become greater than Jesus at COAH including me. My job as lead pastor and church planter is to keep my eyes on Jesus, live by God’s grace for an audience of one, to lead my people with love and grace, make disciple making disciples, send missionaries, plant the church, reach lost and wandering people and to make it hard to go to hell in St. Petersburg, FL. I can not do that if I take my ministry hostage or allow anyone else to do so. If you are in ministry I pray that you read this blog and that it starts a fire in your heart to passionately live for Jesus like all of life depends on it, because it does. Be encouraged! Part 7 of 7 on Leadership: Where Eagles Dare: The Choice – Fly or Walk? Proverbs 20:28 [MSG] Love and truth form a good leader; sound leadership is founded on loving integrity. Now that the leader has established him or her self as a vital member of the organization and has been able to establish his or her team a huge challenge faces them. The challenge is to fly or walk. In numerous organizations and teams around the world leaders start out with a fire in their belly. They kick, scratch, claw, and fight for everything they get. They convict, convince, and complete their teams. They search, structure, and secure their vision, direction, and purposes. They battle the turkeys, tyrants, and teammates for respect, resources, and reason. After they have all of these tasks accomplished the level of energy can reach an all time low. It has been said about many dreams, “Most of the fun in accomplishing dreams is in the fight to get there.” After the fight for the right to lead the leader must dig deep inside and determine to fly and not walk.It is in this time, when energy and emotions are low, a leader must guard him or her self against the temptation to walk.Walking takes less energy. Walking ruffles less feathers. 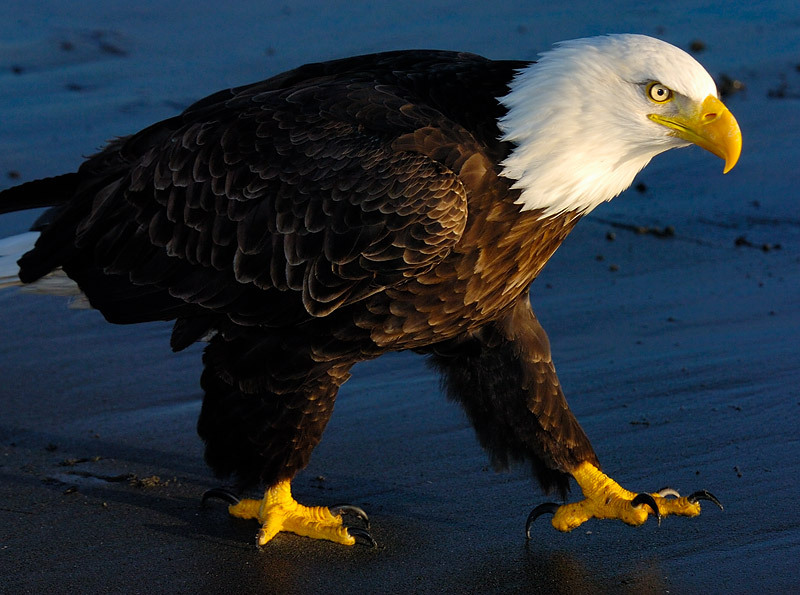 Walking is easier because an eagle does not have to fight for air space on the ground. Walking is dangerous because it is not what eagles were meant to do. A leader must be careful not to walk for long or he or she might get caught and get their wings clipped. An eagle must be careful not to walk because they leave themselves open to the attacks of natural and unnatural predators. An eagle belongs in the sky soaring above the clouds. A leader belongs in the game using their gifts and talents to accomplish their dreams and goals. So determine to fly not walk! The decision to fly and not walk can be made easier by remembering the fight. A leader must remember the reason for the fight and the rewards of winning the fight. They must never forget the fire the that burns bright in their belly. They must remember the vision, purpose, and passion that drove them to take on all comers. When they first came onboard they kicked, scratched, and clawed for everything they got. The kicking, scratching, and clawing took and tremendous amount of energy but it was worth it. It is always worth it. They have convicted, convinced, and completed their teams. This is no easy task. The teams that have been formed are counting on the leader to lead them. Assembling a team through the conviction to do something bigger than they are is powerful. Convincing a group of people to join a team and convincing the individuals that they are the right people for the team and the job is an awesome accomplishment. Completing a diverse team of people, each with special gifts that make the team great and individuals stronger is life changing. To convict, convince, and complete such a team and never allow them to fly is a travesty. A leader must realize the people who are on his or her team expect to fly and not walk. They did not sign on to walk, they can do that on their own! A leader must remember the beginning when they searched, structured, and secured their vision, direction, and purpose.They must remember why they do what they do and they must remember why they are doing to do what they do.Sometimes vision can be lost. If the vision does stay in the forefront of a leaders mind he or she can forget their reason to fly and the ground starts looking mighty tempting. In a world filled with distraction a leader must be careful not to get distracted and lose direction. Losing direction or getting lost in the mundane can cause a leaders feet to touch the ground.This author knows what can happen when the purpose a team was created for becomes undefined. When a leader and team lose purpose they lose drive, focus, and passion. As a result of the loss of the aforementioned components and leader quits flying and ground himself. When a leader gets grounded he or she has the potential to ground the whole team. It is of utmost importance that a leader stays true to the vision, direction, and purpose that has brought him or her to the place they are. Walking must not be an option! Flying must be the only option. Only the leader can determine that flying is the mode of travel for his or her team. Remember the leader sets the standard. In chapter five the challenge and ways to deal with the turkeys was outlined. The leader who has made it through the fire of battling the turkeys, tyrants, and teammates has tasted victory. Battling turkeys is a tough task that has the power to drop the energy level of a leader to dangerously low levels. Especially if the turkey is a “prince” or has the ear of the head leader. Once the battle is over and the turkeys have been thrashed by results based weapons a leader must seek to stay in the air. A leader who decides to walk after battling the turkeys does not win! If they are walking they are side by side with the turkeys. Eagles fly, turkeys walk! Dealing and battling the tyrants is a lot tougher. Sometimes the tyrants are “princes”, sometimes they are other leaders, and sometimes they are inherited form the former team and leader. The tyrants hold a lot more power and pull. If the leader has been successful at thwarting the tyrants he or she should celebrate the victory by flying higher. However, after a battle with a tyrant leaders can find themselves “on the ropes” and ready to “throw in the towel”. It would be easy to decide to walk for a while after a serious battle with a tyrant but that can be harmful to the leader’s future. Walking is comfortable and does not take much effort. Once a leader begins to walk he or she might decide walking creates less stress and uses less energy and he or she may decide they will take the easy way out. The rationale may be “I have won the battle and proved my point now I’ll just walk.” This is not a wise choice. Battling teammates is completely different story. On many occasions this is healthy competition. After the respect of the teammates has been earned a trust is built. Leaders on the same team in an organization that is made up of teams naturally are going to battle for resources and reason. A leader who puts a gallant battle for resources and reason must not be willing to sacrifice flying for walking after the battle or what he or she has secured my be taken and given to the one who is willing to stay airborne. Walking once the respect, resources, and reason has been established is a major mistake for any leader. In this author’s experience it is always tough to continue to fly. The temptation to walk after a successful event, launching, meeting, seminar, or outing is great. I have found that when I leave the sky and hit the ground there is a tendency for my team to do the same. Maintaining excellence in what you do is a must. I found that out the hard way. I decided one time that I would slack off on my responsibilities to recruit and lead current leaders. It was disastrous! I had people taking vacation and no one to cover them. My people were overworked and undermanned. People were leaving and finding qualified replacements was almost impossible. I learned quickly that walking was not for me if I wanted to be successful. I quickly got back in the air and I have stayed there ever since! Of course, it is important to take vacations and breaks to keep oneself fresh and prevent burn out. A leader who is flying and soaring with his team and organization will be able to take those breaks because he or she will have created a culture that allows for breaks. The recovery from my walking took a good long while. Now I strive to keep recruitment at the top of the list and hands on training a priority. This way I keep my team flying high. I do not want any of my team walking so I stay off the ground.